Image optimization is about reducing the file size of your images as much as possible without sacrificing quality so that your page load times remain low. It’s also about image SEO. That is, getting your product images and decorative images to rank on Google and other search engines. When publishing an image on the web, there are some minimum tasks to be applied in order for it to fit your webpage and make it look good and at the same time optimize it so that your webpage load faster. 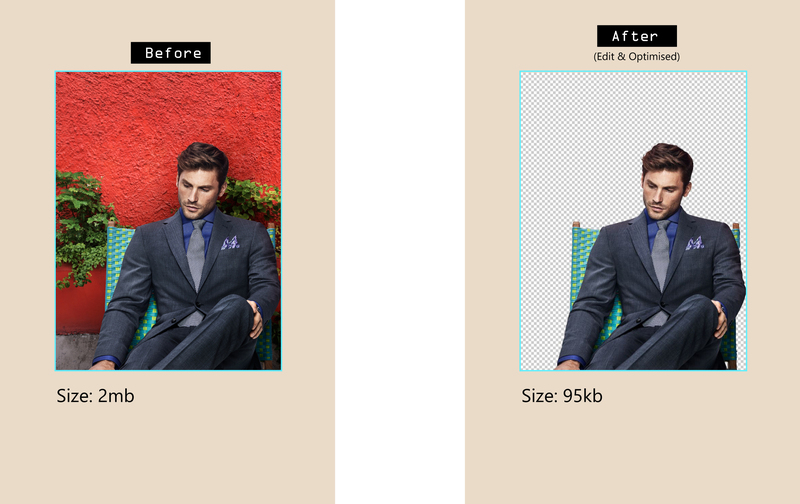 The image optimization tasks may include removing background, cropping extra unused area outside product, straightening, resizing and finally saving it in web-optimized format. On the other hand, PNG is the second commonly used format for publishing images on the web. The reason people use PNG format is that it can hold a transparent background. This is a must if you want to put your photo on the page and you want the background to be seen through the image. PNG format makes the file size a bit larger than JPG. At Photo Editing Expert we optimize your website imagery and design, ensuring all changes are saved in web-optimized format, increasing loading speed.